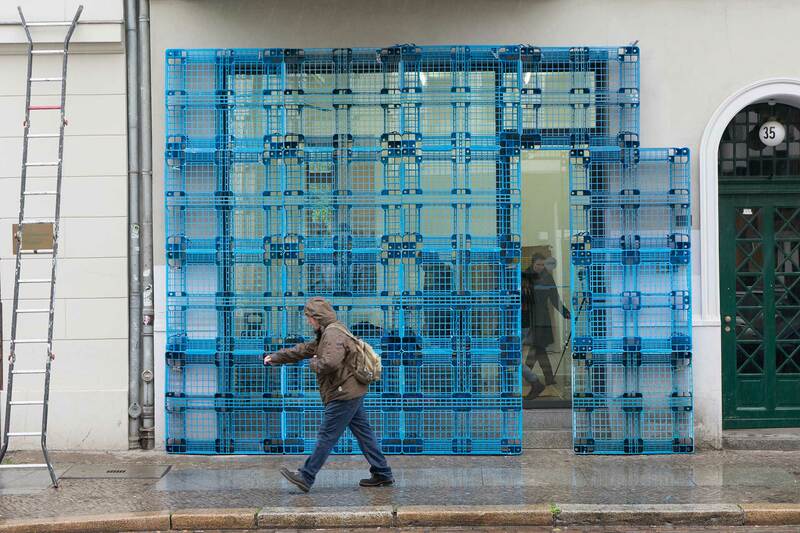 [En] Anna Borgman, Candy Lenk and Jan Körbes installed an ornamental facade constructed from plastic disposable pallets in front of the gallery Aquabit in Berlin-Mitte. Inspired by the recurring ornamentation in architecture, they grapple with the relationship between ornament and function. Going back to the architect and cultural critic Adolf Loos and his manifesto [Ornament and Crime, 1913], the facade develops the question of ornament as an obstacle for new cultural development. 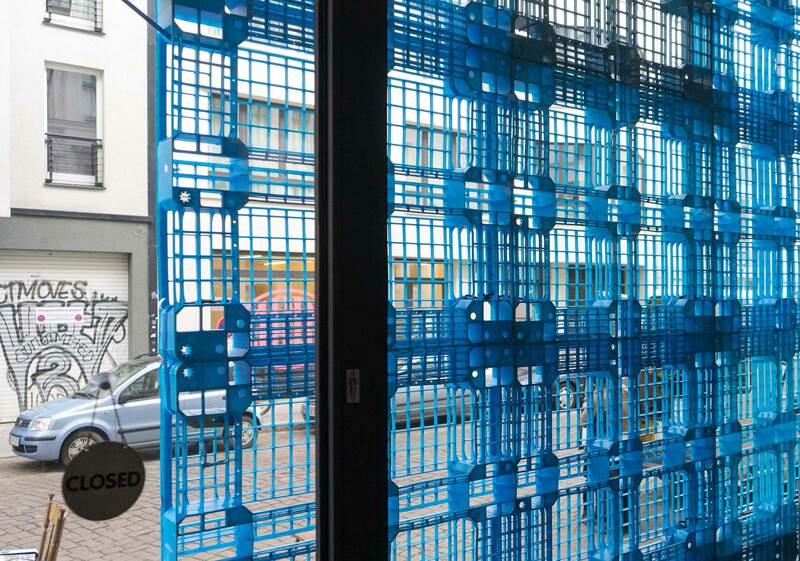 The installation Rekonstruktion focus on the contemporary recycling culture and its ability to transform the functional form into pure ornamentation. 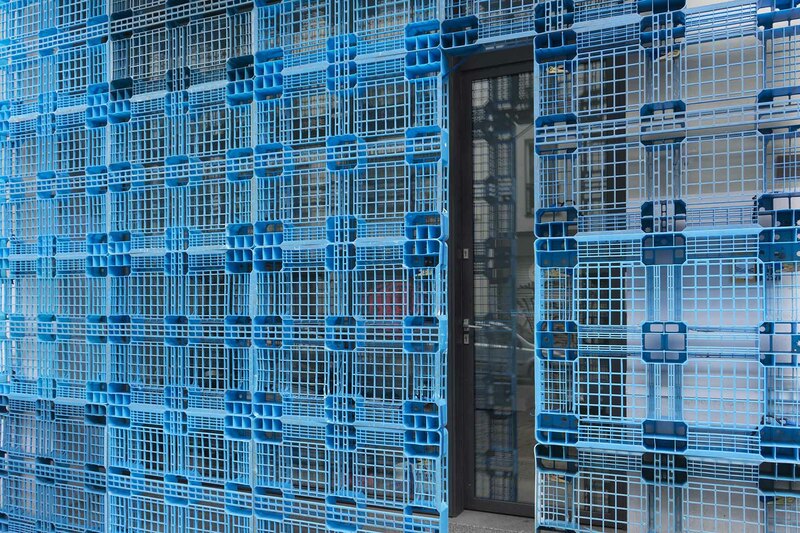 [De] Die Galerie Aquabit Berlin erhält eine, aus Kunststoff-Einwegpaletten konstruierte Schmuckfassade. Inspiriert von der wiederkehrenden Ornamentik in der Architektur, setzten sich die Künstler mit der Beziehung von Ornament und Funktion auseinander. Im Rückgriff auf Adolf Loos [Ornament und Verbrechen, 1913] stellen sie die Frage nach dem Ornament als Hemmnis kultureller Entwicklung neu. Im Fokus steht dabei die Recyclingkultur und deren Fähigkeit die funktionale Form in reine Ornamentik zu transformieren.